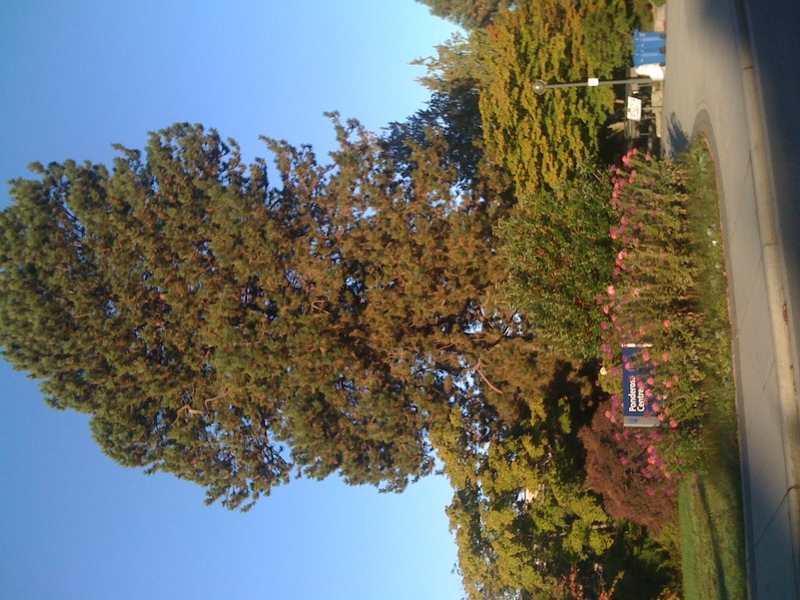 The Ponderosa Cafe was a key meeting place for UBC students for at least 30 years. Today, the once busy building has been turned over to UBC administrative activities among other things. You will still find a tiny coffee pit stop in what was once the entrance and lobby. Current campus transportation options may lead to the Ponderosa being finally torn down to be replaced by a bus loop or perhaps another highrise apartment complex. I was reminded of the old Ponderosa Cafeteria the other day as I was biking across campus on West Mall. Normally I just bike through that intersection but on this particular day the sunlight brought me up short and I clicked a couple shots on my phone . 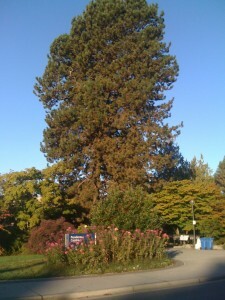 This giant pine is just one of many large heritage trees located around campus. Just down the street is a monkey puzzle tree, over toward Marine Drive one will find a host of large cedars (one or two sporting eagle’s nests). If I wasn’t on my way to teach a class I would have grabbed a cup of coffee and allowed my self to imagine the days when the old Cafe was hopping with students. It’s nice that even while uses of buildings change some things do remain the same -this old pine tree being on those tings. This entry was posted in memories, notable. Bookmark the permalink.